At Toy Fair International, 2014 Hasbro revealed the first three waves of their new (more expensive) Marvel Legends Infinite Series figures, those being Captain America, The Amazing Spider-Man, and Guardians of the Galaxy–each wave tying directly in with a theatrical Marvel film’s release. But in my interview with Dwight Stall (which you can hear in Issue 110 of the Marvelicious Toys Podcast) a secret wave of Legends was teased. It appears we now have confirmation that wave is going to be X-Men themed, and contain several figures that were cancelled from previous waves. We received the image on the right from Marvelicious Toys listener John Classified. 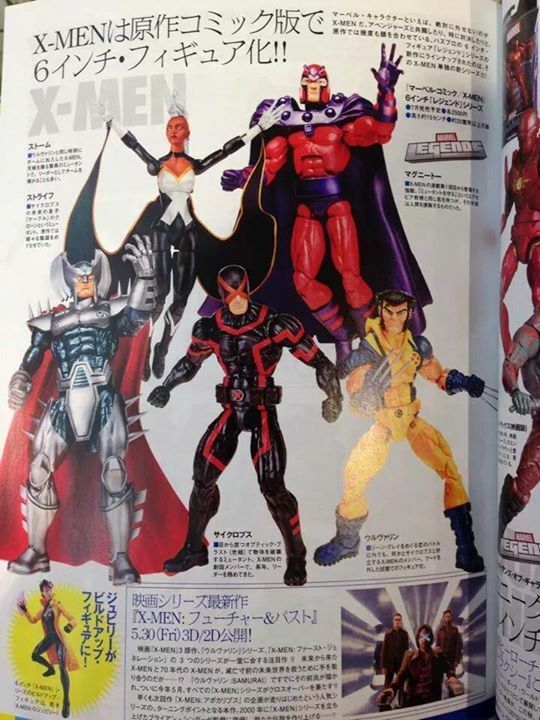 A shot taken from a Japanese catalog shows the X-Men themed wave will have Magneto, Wolverine, Storm, Stryfe, Marvel NOW Cyclops, and the build-a-figure appears to be the long-awaited Jubilee! This release makes perfect sense. Many of these figures, including Stryfe and Jubilee, were shown at the Hasbro booth display at San Diego Comic-Con. The toolings were complete, Hasbro just needed a retail outlet to distribute the figures. And with the release of the upcoming film X-Men: Days of Future Past an X-Men themed wave of figures seemed not only logical but inevitable. More, unlike the Marvel Studios films, such as Thor: The Dark World, Captain America: The Winter Soldier, and The Avengers, where Marvel Comics and Hasbro work together to make figures representing the on-screen looks for these heroes, in recent years when 20th Century Fox puts out a Marvel movie the toys are always comic based. Hasbro only released 4 limited articulation, comic based figures to capitalize on last year’s film The Wolverine. And when I asked at Toy Fair in 2011 about figures for the film X-Men: First Class I was told that Marvel would make toys for their First Class, the comic book series, not the film. So clearly this wave is great for X-Men fans and Legends collectors alike. I’m excited to see Hasbro finding ways to get some of these “in limbo” Legends figures out for retail. But the final question remains…could it be possible for the Pheonix Five Cyclops to be a variant for Marvel NOW Cyclops? One can hope. We’ll report as soon as we hear, so please follow us at Marvelicious Toys and subscribe to our podcast for all the latest updates!